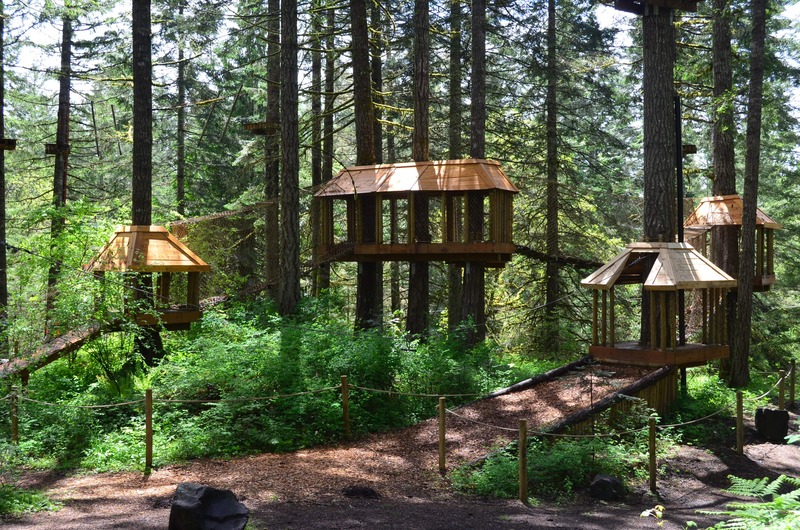 Enjoy a day among the trees at Tree to Tree Adventure Park, located inside a beautiful forest in Gaston, Oregon. While older kids and adults soar through the "big kid" adventures, the little ones can explore the Adventure Village, which is designed for children between the ages of 2 and 8. Adventure Village offers a tree fort adventure playground for the smallest explorers in your group. Activities are kid-friendly, with no safety gear required. The entire village is enclosed and lets kids test their balance on wobbly bridges, play in the lookout platforms and even go for a mini flight on a small hand-held zip line. Children who weigh at least 35 pounds also have access to the Monkey Grove for even more fun way up in the treetops. Kids can't enough of our climbing gym in the trees, and the Monkey Grove is our newest fun-filled activity suitable for all ages. Feel the thrill of climbing straight up a tree to heights of 40 feet and then jumping off. Never fear. All participants must be attached to an auto-belay device for safety for this adventure. It slowly lowers your little ones safely back down to solid ground. We have three different trees available, and kids can climb as high — or as low — as they feel comfortable. For children who don't weigh enough to participate, please inquire about a discount. Your little ones can have big fun playing in the trees at our adventure park. Bring a picnic lunch and dine under our trees while your kids spend the day monkeying around. We're conveniently located about 35 miles west of Portland, Oregon, on Nelson Road right on the edge of Hagg Lake, but you don't need a Hagg Lake parking permit unless you plan on spending time at the lake before or after your aerial adventure. Make a reservation to swing on by from March to mid-November by calling (503) 357-0109 today.